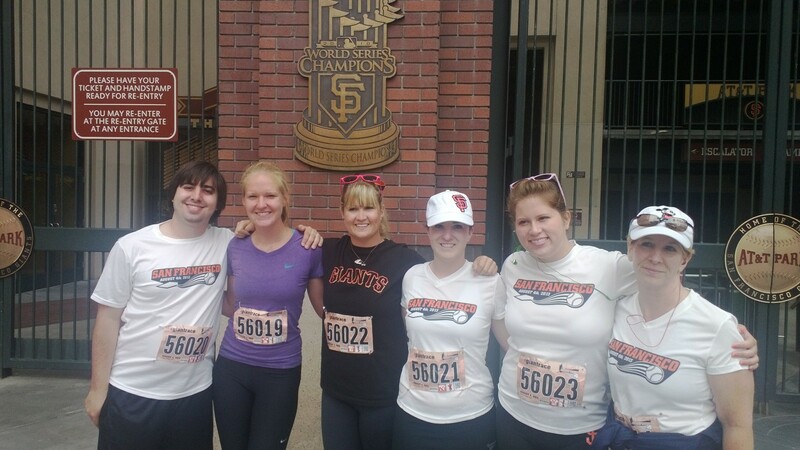 A team of Dublin volunteers and avid runners recently donated some sweat to raise money for Project Open Hand, in conjunction with event sponsor San Francisco Giants. The team beat their goal of raising $1,000 for this worthy cause. According to Dublin High School alum and team captain Ann Kenney, “Since 1985, Project Open Hand has provided vital nutrition and compassion to some of the neediest individuals in our community. Project Open Hand provides meals, groceries, and nutritional counseling to individuals living with HIV and AIDS, individuals who are homebound with other critical illnesses, and seniors in San Francisco and Alameda County. At Project Open Hand, the goal is to feed the body, mind, and soul, through healthy food prepared and delivered with love, by dedicated staff and volunteers. Ms. Kenney continues, “The members of our team, Teri Kenney (District Employee), Alison Pitts (DHS Alumni), Ciera Taylor, Maya Baranouskas, Nick Kouri (DHS Alumni) and myself were all very moved by this organization and what it was doing for those who were unable to provide meals for themselves. We made it our goal to raise over $1,000 and through donations from family and friends as well as the money we raised from a yard sale, we were able to achieve our goal and then some. Our total raised was $1,150, which allowed us as a team to go to a special warm-up room, where we learned that we were one of only three non-corporate teams to raise over $1,000.